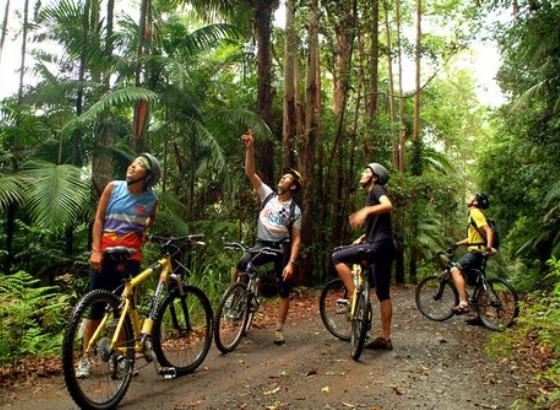 Perrys Road Lookout is a popular starting point for rides in the Urunga/Bellingen areas. It is approximately 20 km from Coffs CBD, depending on the route taken. Add the following distances to estimate a great return ride from Coffs. Description Down the hill, and then an easy 5km along the river. Start/finish Perry’s Lookout to Mylestom return. Highlights Lovely ride and a great destination, especially as an extended ride from Sawtell or Coffs. Continue riding south down the Old Pacific Highway. Turn left into Mylestom Drive – an easy, flat 5km trip along the river into Mylestom. Swim in the river pool enclosure or enjoy a picnic. There is a local General Store and Cafe. Take an alternative route down Perrys Road and turn right into Repton Road, winding down the hill to meet up with Mylestom Drive. Description Picturesque on-road ride along river flats and farmland. Light traffic but very bumpy! Highlights River views, woodland, mangroves and open farmland. Head south along the Old Pacific Highway, over Raleigh Bridge, and continue to the Pacific Highway. Ride for a short distance along the Highway, then turn left into Yellow Rock Road, over the level crossing and through a residential area. Rejoin the Old Pacific Highway at Raleigh Bridge. Avoid the hill back up to Perrys Road by starting and finishing in Raleigh. Caution required on cattle grids, railway crossings, and the narrow shoulder on the Pacific Highway. Route Raleigh to Bellingen circuit. Description A challenging, on-road ride through ‘rolling countryside’. Highlights Farmland and forests along the Kalang and Bellinger Rivers, and the charm of Bellingen. Take South Arm Road to Bellingen, returning via North Bank Road. Head south along Old Pacific Highway through Raleigh. To avoid the current Pacific Highway, turn right onto Waterfall Way. Take Short Cut Road, then South Arm Road. Travel for 14km along the river. There are some hills. Turn right onto Bowraville Road. It is another 6km into Bellingen, where you will appreciate morning tea or lunch to reward your efforts. Take the opportunity to explore this popular and alternative heritage town. Head north out of Bellingen by taking Bridge Street over the river. Turn right at the roundabout and head east on Wheatley Street which becomes Northbank Road. After about 12km you will rejoin the Old Pacific Highway just north of Raleigh Bridge. This stretch has rough surfaces and a few hills. A shorter and easier option (32km) is to ride Northbank Road each way. Description On-road route, includes approx. 8km of gravel. Suit MTB or hybrid. Significant hills, light traffic. Highlights Experience tranquil green rolling pastures, bordered by lush sub-tropical bushland and backed by the mountain escarpment of the Great Dividing Range. Head north over the river (Bridge Street) and turn left at the roundabout. Wheatley Street then becomes Gleniffer Road. Roses Road (veer left after 2km) is a worthwhile scenic detour. It has some gravel sections.On Gleniffer Road, cross the Never Never Creek, and then continue north. The Promised Land Road loop is 10km – which includes about 5km of unsealed road. There are popular swimming and picnic spots at Never Never Creek.